My Copper obsession is beginning to get just a little out of hand. So it will come as no surprise that I picked up Barry M's Copper Mine as soon as I spotted it. 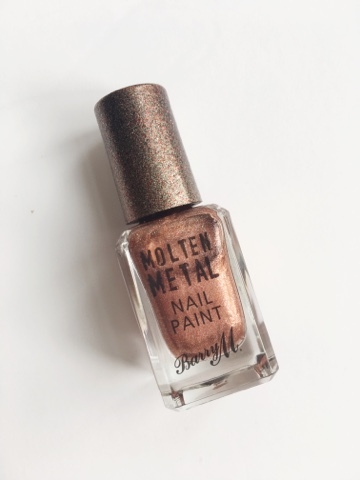 Copper Mine forms part of the 4 shade Molten Metals Summer 2016 range from Barry M. Available from both Boots & Superdrug, each shade retails at a purse-friendly £3.99. I'm going to dive straight in and say that this nail varnish is absolute perfection. The coverage is amazing even with only one coat applied. In addition, the colour is astonishing with just the right amount of shimmer to give the perfect copper colour.